Deed #14- Saint Stephens Episcopal School Externship Program – Giving students interested in the legal field an “in office” experience of job shadowing. The Saint Stephen’s externship program provides students the opportunity to explore various interests, passions and curiosities. Students can gain greater knowledge about a career they might be interested in pursuing through a focused, hands-on externship during their Interim Quest Program. The program is overseen by Patrick Whelan at Saint Stephens and runs during the week of May 21-25, 2018. Phil Hammersley, a Shareholder with Norton Hammersley, was contacted by Saint Stephens and agreed to participate. We had the pleasure of hosting student Thomas Joyce for several days during the Externship week. Lawyers and Paralegals from each of our practice areas engaged Thomas in extensive dialogue concerning legal issues, solutions, practical issues in the practice of law and law office management. He was able to be included in client conferences and telephone calls, attend closings, learn on research is done and attend closing arguments on a tobacco lawsuit that Norton Hammersley was not involved in. 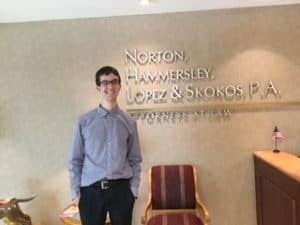 We all thoroughly enjoyed having Thomas here at Norton Hammersley.